Combine all the ingredients in a mixing bowl. 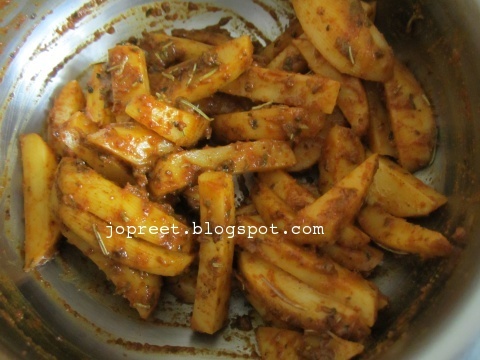 Add potato slices and mix well with the masala. Close it and keep aside for 20-30 mins. Preheat Oven to 220 degrees C for 10 mins in grill/broil mode. Take the baking tray and spray little water. Place the aluminum foil and grease it with little oil. Spread the potato slices all over the tray. Keep it on top rack of oven and set the grill mode. Set the timer to 10 mins. Once done, turn over the slices and keep for another 10-15 mins. Serve hot with mint-coriander chutney. Superbly yum Preety..Loved the composition and all your clicks. Potatoes are my favorite.. 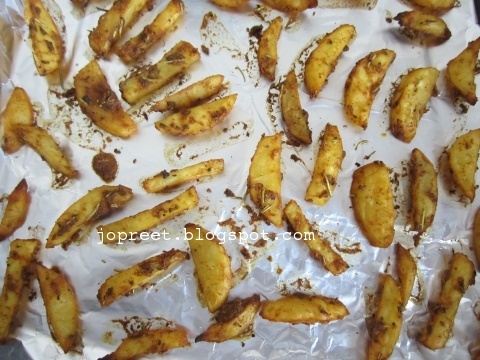 I often roast potatoes in oven too but with different spices.. These looks so delicious.. love the clicks! potato is one of the veggies where it wont go wrong 🙂 oven roasted is somthing i wanted to try for long time ! One of my fav ways to have potatoes! 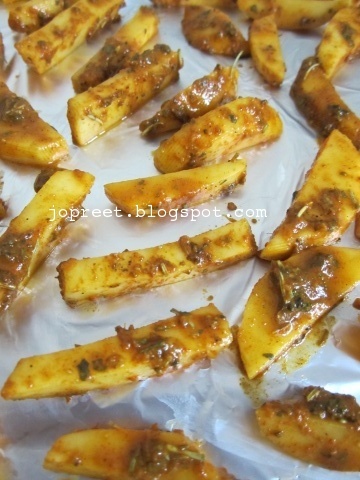 preeti, my girl loves this with mixed spices. Looks great, perfect, perfect, perfect…. Excellent and mouthwatering potatoes. Looks delicious. Very tempting and yummy potatoes. looks great.loved your baked version!! Makes me drool even after having my dinner, fantastic and beautifully oven roasted potatoes.. This with a bit of curd rice is a heavenly combo. Wow so tempting recipe…clicks r amazing..